Tai’Shaughn Terrell Mathews, 14, passed from this world June 28, 2016 at his home. Celebration of Life will be 3:00 pm Thursday, July 7, 2016 at the Church of the Harvest, 14841 S. Black Bob Rd, Olathe, KS. The family will receive friends at 2:00 pm before the service at the church, with service following at 3:00 pm. Inurnment will be at Sunrise Cemetery in Manhattan, KS at a later date. Memorial Contributions may be made to Bruce Funeral Home, Spring Hill, KS, 913-592-2244, to help with expenses. Tai’Shaughn was born July 7, 2001 in Manhattan, KS to Crystal Nichole Kelley and Jai’Vaughn Mathews. He completed his freshman year at Spring Hill High School, and enjoyed art and drawing and being with his friends, of which he had many. He was active in the baseball and wrestling programs. Tai loved spending time with his family and friends, and he will be missed and celebrated by all. 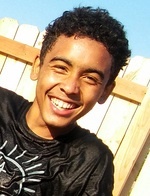 Tai loved skate boarding, watching cartoons and listening to music with his friends and family. Most of all he loved to do back flips, and make others laugh while he laughed. Tai’Shaughn is survived by his mother and step father, Crystal Jackson (Quinn Dale) of the home; his father Jai’Vaughn Mathews (Nancy) of CA; his beloved siblings Imari Mathews, Dai’Vion Jackson, Ania Richards, of the home, Jazzlyn Garcia (Oscar), of Enid, OK and many beloved step brothers and sisters; his grandparents Coty Gilman of Manhattan, KS, George Kelley, Jr. (Michelle) of Abilene, KS, Sheila Mathews of CA; and great grandparents George Kelley, Sr. (Gene) of Abilene, KS.